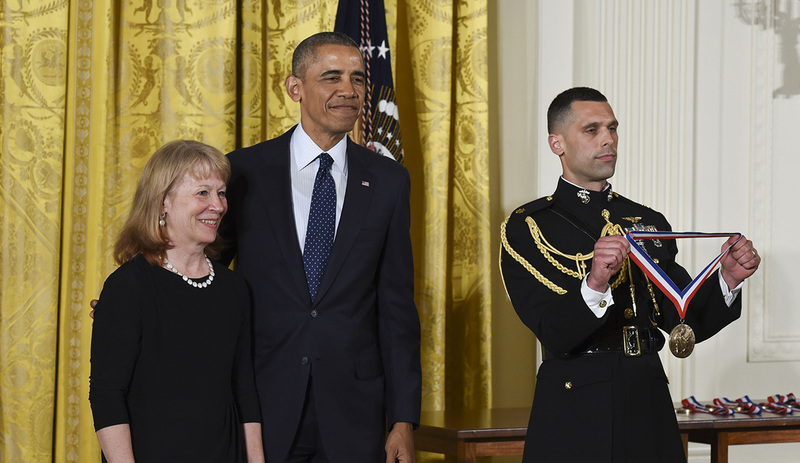 University of Oregon chemist Geraldine "Geri" Richmond, a leading researcher and a prominent advocate for women in science, finally joined her award-winning peers as she and other medal winning scientists, engineers, mathematicians and innovators, headed to the White House. They are in Washington, D.C., for the May 19 ceremony in which President Obama recognizes them for their lifetime of contributions to science and innovation. 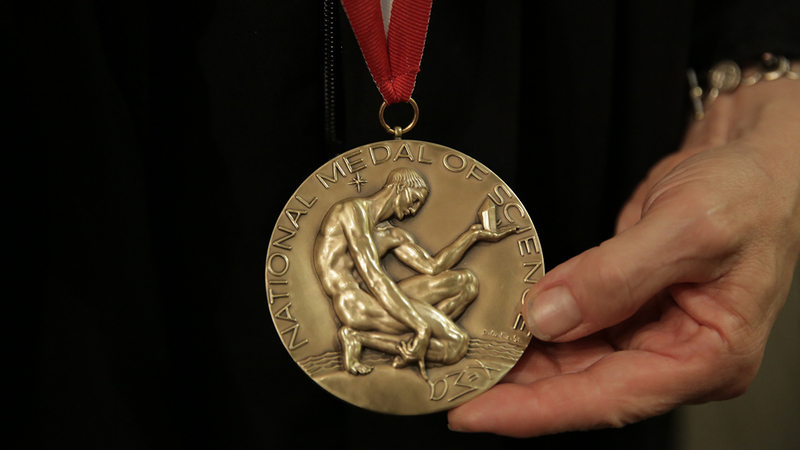 Richmond was among nine winners of the National Medal of Science, the highest scientific honor awarded by the U.S. government. Initially, the awards were to have been given Jan. 22, but a winter storm shut down the nation's capital. Richmond’s journey to a presidential honor has seen challenges, including growing up in a family with limited finances and being a rare female in her field. Along the way, Richmond has always asked "why" — with a gritty determination that her mother encouraged — and sought solutions. Money always was tight on the small family farm where Richmond was raised south of Salina, Kansas. Her father, Dale, and mother, Lucille, were lucky to have the farm, she said. It was purchased with hard-earned proceeds put together from a small drive-in restaurant that they ran around the clock during World War II to feed the troops from a nearby U.S. Army airfield. The Great Depression kept her parents from going to college. Richmond, the third of four girls, was filled with curiosity as a youngster. Her introduction to chemistry may have started when she was a young girl fascinated with smoke billowing from trash fires. Using jars, she captured smoke samples to study what smoke was and why its color sometimes differed. She also was curious why the smoke in her jars always disappeared within hours, turning into a layer of soot at the bottom of her jars. Her project came to an end one day when she had gone into the yard alone to start a new fire to gather new smoke. Absorbed by the task directly in front her, she accidentally allowed the fire to spread into a field, resulting in her frantic mother dashing from the house to extinguish it. Richmond’s inquisitiveness led her to Kansas State University, following her two older sisters into higher education. All three earned doctorates. "My parents did everything that they could to get us to college, knowing that they couldn’t afford it," Richmond said. "They sold the farm and started a beauty shop and clothing store in nearby Lindsborg. As we grew older and college loomed, they courageously moved that small struggling business to Manhattan, Kansas, where we would at least be near a college." At KSU, Richmond aced calculus, chemistry and engineering physics. In her junior year, she applied for an undergraduate research position, but was rejected even though she was top in the class. She learned that her gender had worked against her. She landed in another lab. "Even that next professor had to be convinced to take me," Richmond recalled. "He wasn't sure if I could handle a gas cylinder. Had I not had the opportunity to do research and teach as an undergraduate I absolutely would not be where I am today." Richmond went on to earn a doctoral degree from the University of California, Berkeley, and then accepted a faculty position at Bryn Mawr College, an elite small women’s college in Pennsylvania. Teaching came first, initially, but her research interests grew. In 1985, she won a Presidential Young Investigator Award from the National Science Foundation. The five-year grant goes to early career scientists whose research shows exceptional promise. "It helped me to realize that I could be more than I ever expected," she recalled. To move her science forward with that grant, she realized that she needed to be at a research university. A job search led to the UO, where a series of donor-funded faculty chairs eventually boosted her research on water surfaces. "Water is an amazing compound. It is the most complex and simple chemical, yet its molecular surface properties remain a mystery," she said. "What happens when other compounds such as oils and pollutants come in contact with a pristine water surface?" For her research, she designed state-of-the-art laser systems, optics equipment and computers that work in tandem to understand molecular processes at liquid surfaces that have environmental importance. Her research has provided valuable insights into the way water surface molecules stick together and how this surface bonding is altered when in contact with oils, dispersants, surfactants and gaseous pollutants. Of particular note was her discovery that countered the notion that oil and water don’t mix. There is actually a very weak bonding at a surface between the two that has implications for many biological and environmental processes. In 1998, Richmond was selected for the Philip H. Knight Professor of Liberal Arts and Sciences, an endowed chair funded by the founder of Nike. When shown copies of the nomination letters with the names removed for privacy reasons, she found comments in one submission that stunned her. "It said that Richmond is doing the quality of science that someday could get her into the National Academy of Sciences," she said. "It was an ah-hah moment for me and was gratifying to see our work was appreciated." In 2011, she was elected into the academy. A year later she was appointed by Obama to the National Science Board. She also is serving as a U.S. science envoy to Southeast Asia. In February, she ends a one-year term as president of the American Association for the Advancement of Science. Richmond received her second endowed chair at the UO in 2001 as the Richard M. and Patricia H. Noyes Professor of Chemistry. 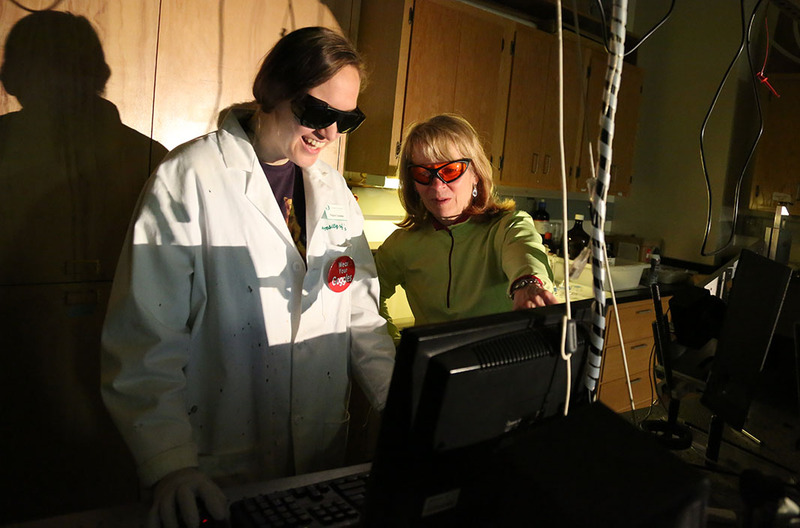 In 2013, she was named as the UO’s Presidential Chair in Science, the second of two presidential chairs created with $5 million in gifts from an anonymous donor. "Endowed professorships at a university level have become increasingly important for the financial assistance and also for recognizing excellence,” she said. “The title opens doors and is a very visible indicator of the value that your university has in your scholarly endeavors. I’m very grateful. It means a lot that a donor thinks so highly of our work and wants to help move it forward. 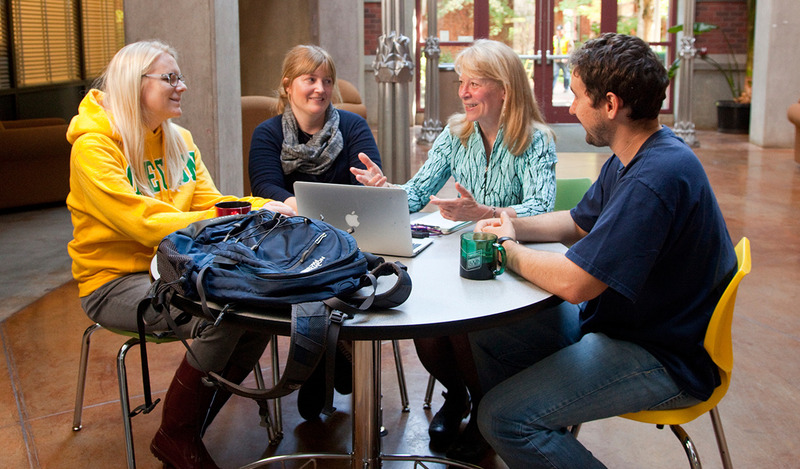 A great faculty advances everything at the university. It also attracts great students." Even as she has achieved personal success, she became increasingly aware of different types of discrimination that she and many of her women colleagues around the country were experiencing. Doing nothing was not an option. In 1998, Richmond and Jeanne Pemberton of the University of Arizona co-founded COACh (the Committee on the Advancement of Women Chemists) to address these issues. 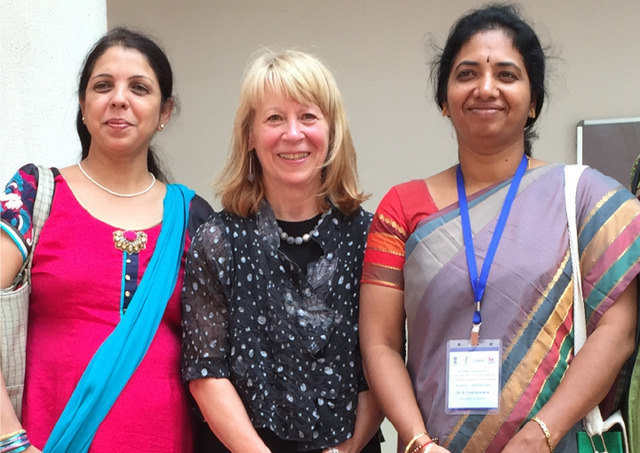 The organization delivered a series of successful workshops around the U.S. on negotiation, leadership and conflict resolution to more than 15,000 women in all fields of science and engineering. Since 2010 Richmond has taken COACh to developing countries in Africa, Asia and Latin America. These international workshops, which include guidance on publishing and proposal writing, have been conducted in more than 20 countries. While the National Medal of Science she received from Obama recognizes individual scientific achievements, Richmond says it really honors the 130 current and former undergraduate students, graduate students and postdoctoral researchers who have worked in her labs. "They are the ones who work in the laboratory everyday," she said. "It's really a credit to them."